To see more projects and full directions for clay on paper mache projects click here to go to page 1. 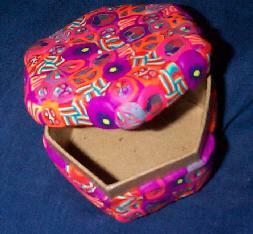 Polymer Clay On Commercially Made Paper Box. Would work even better with older children. 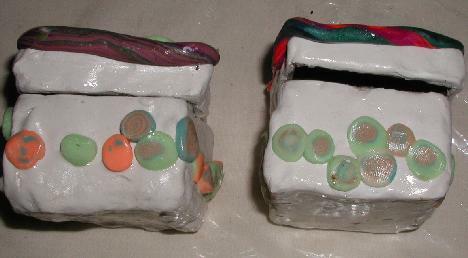 See the general directions for applying polymer clay (I use Sculpey with young children) on to paper mache boxes on the left and on page 1. Project time 1 hour over a couple of days. First to be politically correct, you can call them tooth collection boxes if you don't want to use the tooth fairy theme. I did use some glow in the dark clay to make it easier for the "fairy" to find the teeth. Actually all kids but especially preschool children love glow in the dark anything... beads, clay etc. So I thought it would be great for this theme. Children can be told it is for their parents to use and it glows for them not to loose them. Enough political correctness back to lessons. Supplies specially for this project. Sculpey white sold in 1 3/4 and 8 pound boxes. For 14 projects I used about 3 to 4 pounds. Scraps of Sculpey in multicolors to roll and twist into snakes. Plastic covered containers to store clay between uses. Sculpey glow in the dark clay. Sold in set of 4 with a tool or ,now in some stores, individually. I made 14 and used one set of 4 colors. Pasta mache, roller or brayer. Kids love the pasta mache and it is faster even with giving each child a turn. Remember once you use a pasta mache for clay you can not use it again for food. The teacher should do apply the sobo glue and let dry the day before this project. Children are given wax paper for a clean work surface and an egg size or larger lump of clay. Allow them to play with it for a while but you should suggest they keep it in one piece. Or they will have fun but make a mess of little pieces that they then loose on the floor. Depending on how much time you want to spend on this, let them play but the white clay softens fast. Have them take a turn putting their clay through the pasta machine. The teacher collects the white clay and lays them out on wax paper near her. Children are then given the glow in the dark clay to soften/play with. I suggest each get only one color so they can't mix them by mistake. While they are softening, teacher can trim the white to cover the boxes. Covering the sides and the bottom. I suggest the teacher does this later and do this project in two days. But if you have a helper and patient children it can be done in one day. White is trimmed for cover to fit on top. Children's name should be marked inside with a permanent marker on both the top and bottom pieces. Collect the glow in the dark clay and hand the children the Sculpey scrape clay give them a ball of assorted colors or have them mix colors and roll into snake. While they are making the snake, roll the glow in the dark into sheets and make jelly rolls. Collect the snakes when they are long enough to go around the rim of the top. Again if doing in one day, cut jelly rolls into slices (saving the white for the teeth shape decorations) and place enough for each child on to individual sheets of wax paper. I suggest you do this twice, giving only enough for either the cover or the sides of the box at one time. While they are doing this take a small piece of the white and shape into teeth. I caution the children not to press the cane slices too hard to sqwish them. Pass out two teeth to each child on wax paper or place on their original wax paper. I find it easier to not keep track whose snakes are whose and warn the children they will be sharing the snakes. But if you have time you can place the snake around the edge of the top using their snake. When fully decorated collect the boxes for baking. Follow the full directions from page 1 etc for baking. When baked and cooled, teacher should apply the glaze and let dry. To return to site index.